I’ve been to the Celtic Manor Resort numerous times for a variety of work functions, conferences and events, but had never eaten in the resort’s flagship fine dining restaurant, Terry M (named after the resort’s owner, entrepreneur Terry Matthews). I’d always found the food at the resort very good, so when we were invited to visit Terry M (the restaurant, not the man) for one of their Sunday jazz lunches, we were looking forward to it! The restaurant, with head chef Tim McDougall, has three AA rosettes. It’s just off the main reception foyer of the resort, which can seem large and busy at times – but the restaurant manages to give guests a secluded feel, and certainly offers the elegant, refined surroundings of somewhere that proclaims itself to offer fine dining. It looks out, through French doors, onto a small courtyard area, which again makes it feel much smaller than the resort it’s part of. 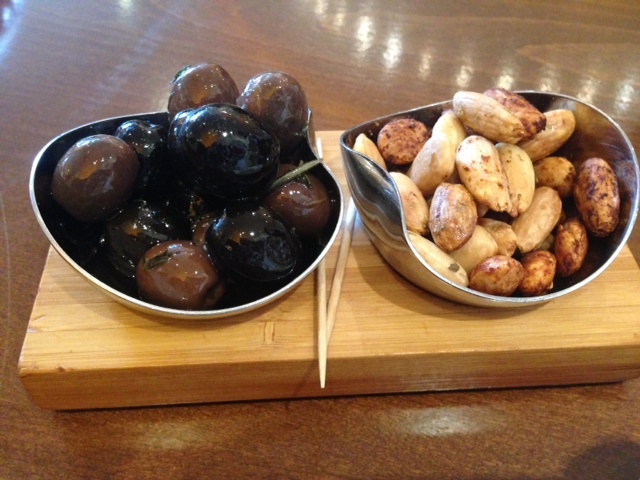 We enjoyed a drink in the lounge bar area beforehand, along with some delicious olives and roasted almonds, before being shown to our table by one of the very polite, attentive and efficient staff who served us during our visit. 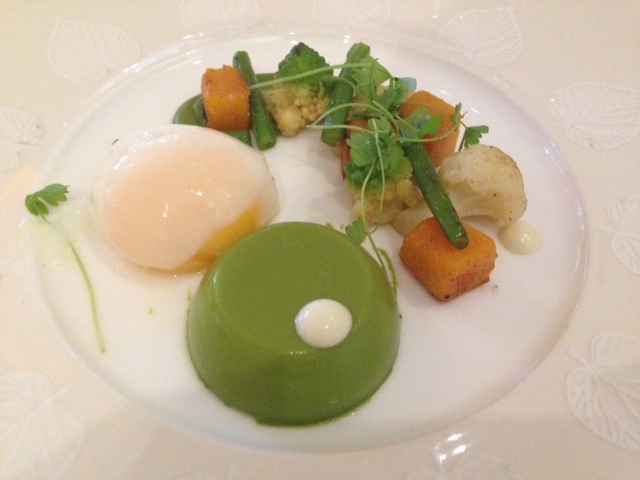 To start, I chose the intriguing-sounding green bean pannacotta, served with warm vegetable salad and slow cooked egg. The dish looked very pretty, and the green bean pannacotta had a good texture and certainly tasted of green beans. Of the warm vegetables, small cubes of butternut squash were by far my favourite (and the most flavoursome). Whilst everything in the dish was cooked perfectly, I’m not entirely sure that the texture of the pannacotta with a soft egg was a great combination – but I was glad I tried it as it was so unusual. 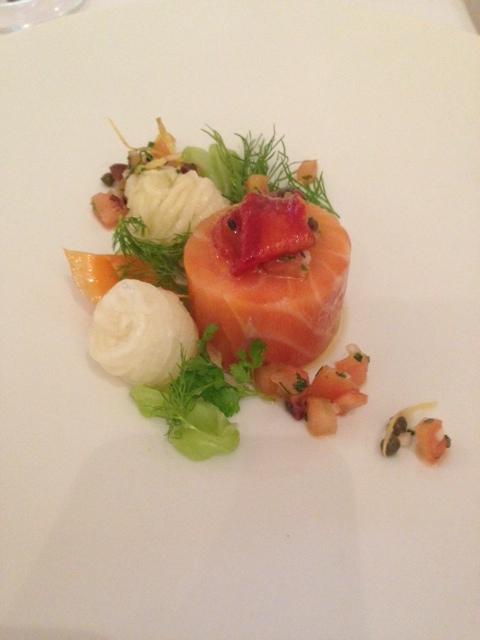 Mr W opted for a less adventurous salmon ballotine, served with sauce vierge and vegetable crudités. Again, the dish was beautifully presented, and the flavour combination worked well, with an abundance of fresh dill, which is one of my favourite herbs. Only a sundried tomato on top of the ballotine seemed slightly incongruous but didn’t spoil what was an excellent dish. 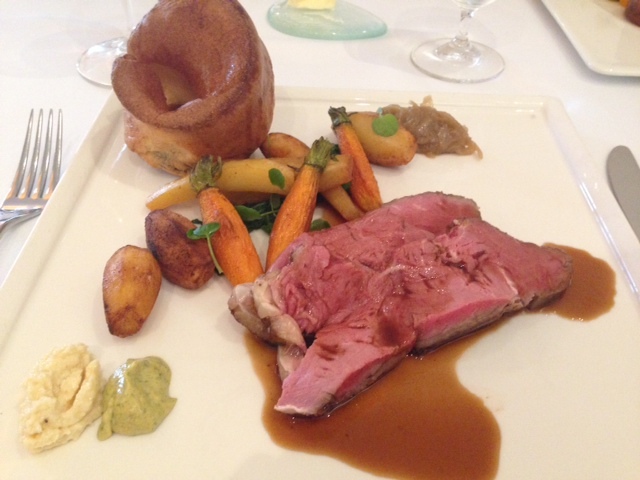 I love a good roast beef dinner, and I felt sure that if anywhere was going to do it well, Terry M would – so I chose Usk Valley beef from the carving trolley with traditional accompaniments, but was intrigued as to how a traditional roast would be presented in ‘fine dining’ style. 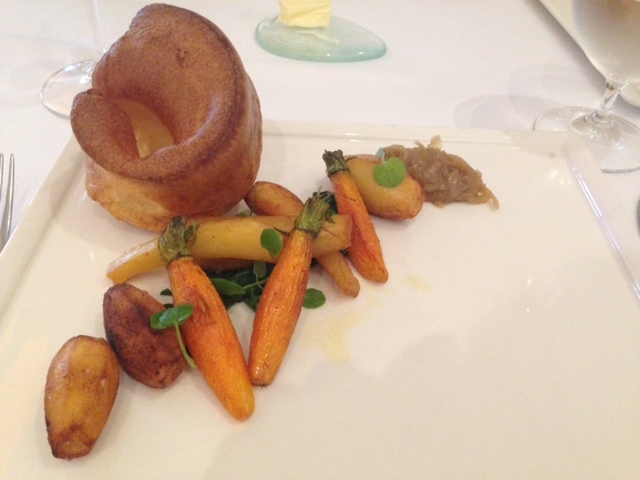 My answer came in the form of my ‘pre-loaded’ plate of traditional accompaniments: beautifully shaped baby vegetables and roast potatoes, with an artfully placed Yorkshire pudding and a quenelle of sweet onion relish! From the trolley, I was served a skilfully carved slice of rare beef, some red wine gravy (which appeared a little thin but was deceptively rich and flavoursome) and a selection of condiments from the traditional (horseradish, English and French mustard) to the more unusual (mustard with tarragon, which I tried and particularly enjoyed). The beef was delicious, as was everything else on the plate, but my only slight complaint was the temperature of the food. The trolley it was served from simply had the beef on a wooden board, so it was always going to cool down quickly, and by the time it reached my plate it was almost cold, but this could have been saved by some really hot gravy. Sadly, however, the gravy on the trolley didn’t seem to be heated either, so my meal was definitely on the cold side. 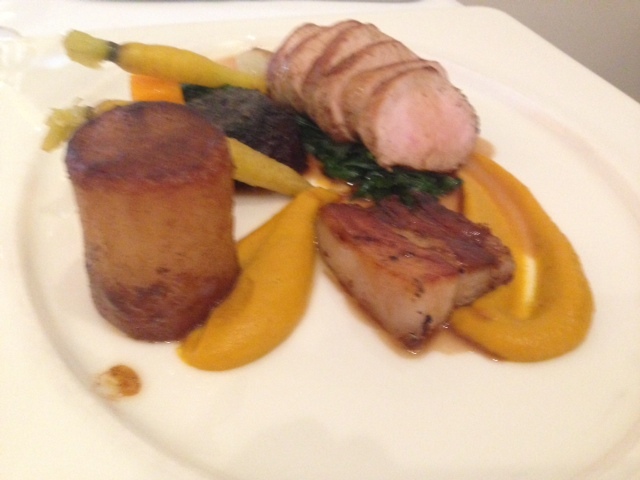 Mr W chose a trio of British pork, which comprised loin, belly and black pudding, served with sticky fondant potato and heritage carrots, including a puree. This dish was absolutely delicious, especially the beautifully tender pork loin which was cooked perfectly. Again, however, the food was lukewarm at best. 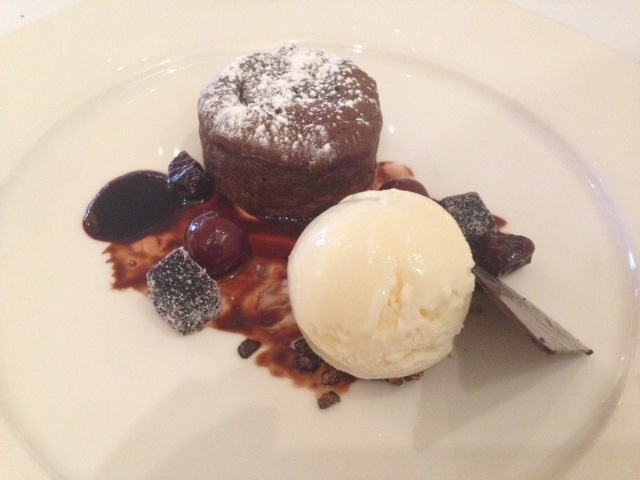 To finish, I was swayed by a chocolate fondant (again, one of my favourite desserts if done well – and by now I was confident it would be) with griottines and cream cheese ice cream. As I’d predicted, the fondant was pretty much perfect – a thin crust with a gooey centre just waiting to ooze out – and the sharpness of the griottines was a perfect contrast. Cream cheese ice cream gave another slightly sharp edge and was a better accompaniment than the usual vanilla. The dish was finished with cubes of intensely flavoured cherry jelly and I’d have happily framed it, had it not been crying out for me to eat it (I made do with Instagramming it instead). 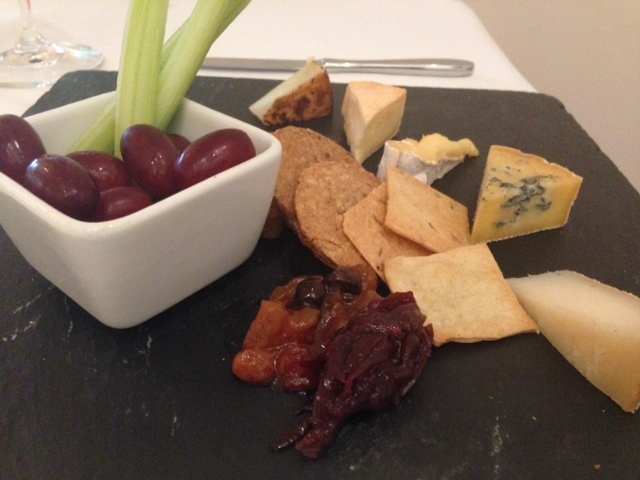 Mr W eschewed the other sweet choices to try the cheese board, which featured a selection of British and European cheeses and came with a good selection of homemade biscuits, sweet red grapes, crisp celery and two different relishes. The cheese was all room temperature as it should be and the different elements were well proportioned. 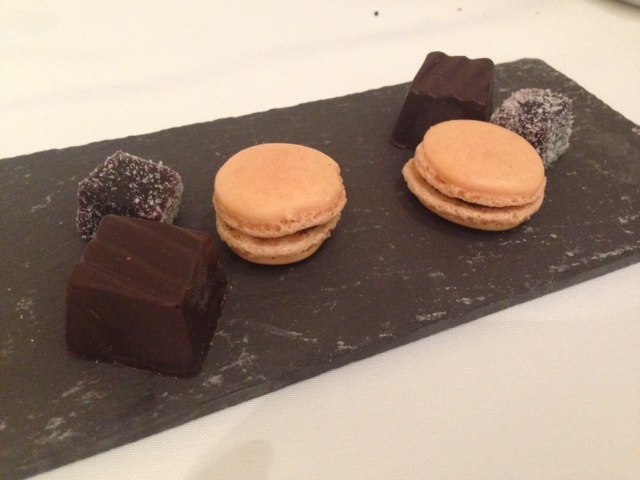 We finished our meal with a selection of petits fours and a coffee. Throughout, we were entertained by a jazz guitarist who played very easy listening jazz at a low volume that wasn’t intrusive. Mr W felt he could have ‘performed’ a bit more – I disagreed as I felt background music was right for the occasion. All in all, we really enjoyed our meal at Terry M. The food was excellent (save for the minor temperature gripe with the main courses) and the service was fantastic. Two courses are £23.50 and three are £28.50, so it’s not bargain basement, but if you want a fine dining treat without paying evening prices, it’s a good option. There was also a good selection of reasonably priced wine, including carafes, available. I’d definitely recommend it as a destination for a relaxed yet refined Sunday lunch, and I will certainly be going back to try the menus on offer on other days of the week. We were invited to Terry M as guests and as such all our food and drink was complimentary.